In encyclopedias of art over time, may be written something like this: “Baumanskaja School of Painting. The late twentieth and early twenty-first century. 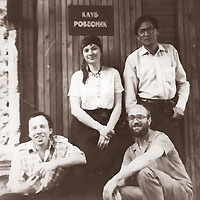 Group of the painters from Moscow, united on formal territorial attribute. Figurative painting”. In reality, of course, difficult to predict, how will be appreciated the artists century later, when time will erase the subjective judgments, together with the judges. But the phenomenon that exists more than 20 years deserves an attention as a minimum. Sutyagin, Svetlana Sutyagin, Alexander Shevchenko – these artists are united not only by the fact that they together began their way in the Evgeniy Stasenko’s studio located on Baumanskaya street near the metro station Baumanskaya . There is also another trait common to them: they are not afraid to look old-fashioned. Of course, the epidemic of modern art was not passed them. In one form or another in their time, they paid tribute as to the installations, so to the performances, the happenings and the hoaxes. But, while the method of interpretation of reality in art can take various forms, means of expression are always chosen by the principle of the maximum efficiency. And so turned out that the classical oil painting on canvas became for artists of Baumanskaja School of Painting the most effective tool for communicating with the world. With regard to the evaluation of their creativity, these artists, at least, deserve the merit of confirming the viability of the chosen genre, to which still early in the twentieth century had been predicted the death and oblivion. Their art continues the best traditions of the world art.